Recently, I tried my hand at making lip balm. I wanted to get everyone in my extended family something small but thoughtful for Christmas. I'm a total lip balm junkie myself, and when I found a recipe for DIY lip balm online, I couldn't resist giving it a try. It turned out great! I used this recipe from Instructables, which I found via Pinterest. It's really simple and once you get all the ingredients, it's a snap to make. You will also need a pot or saucepan, a smaller container for the ingredients, measuring spoons, lip balm containers, and a dropper. The instructable tells you to just pour it in, but that could get really messy! 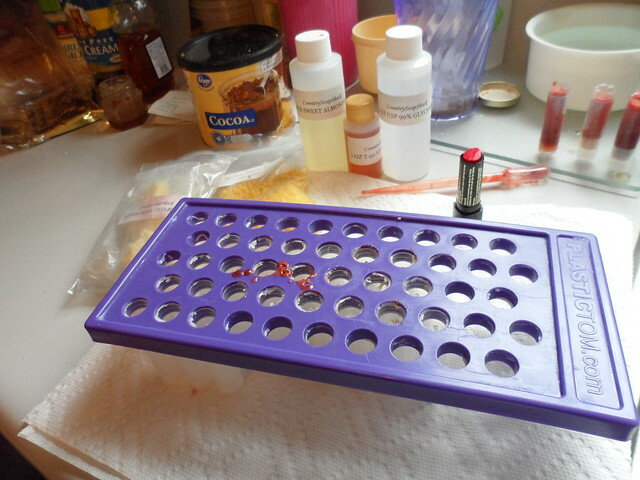 I also used a tray specifically for filling lipbalm; it isn't strictly necessary but again, it's less messy that way. After you've measured out your ingredients, you just need to melt them down and pour it into containers. Melt your ingredients in a small cup inside a pot of water, double-boiler-style. I got lip balm tubes from the same place I got all my other ingredients; you could also use old ones you already had or little pots or whatever, really! 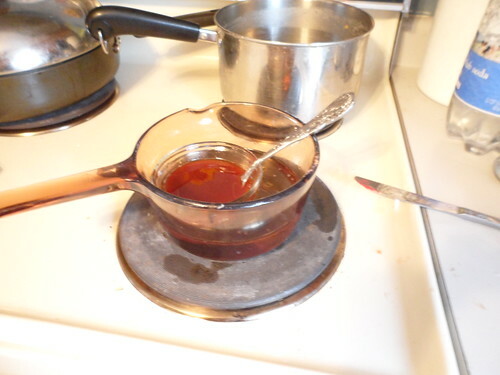 Make sure everything is stirred up really well; the honey has a tendency to separate from the rest of the mixture, and if that happens then it won't harden as it cools. It's a good idea to buy disposable droppers for getting the lip balm into tubes. The lip balm hardens as it cools and after a while it will clog up the dropper. For that reason, throwaway plastic droppers would be better than a glass eyedropper or turkey baster or whatever. The lip balm will cool very quickly after being taken off the heat, and your tubes should be hardened in under a minute. I had very good luck with this recipe other than the separating issue - I ended up with a few duds in my batch, but the rest turned out great. So long as the proportions are consistent, you can play around with the recipe and adjust it - just remember to keep in mind how you change the recipe will affect your finished product. For instance, the more oil or less besswax you add, the softer the balm will be. If it's too soft, it won't work in a tube. 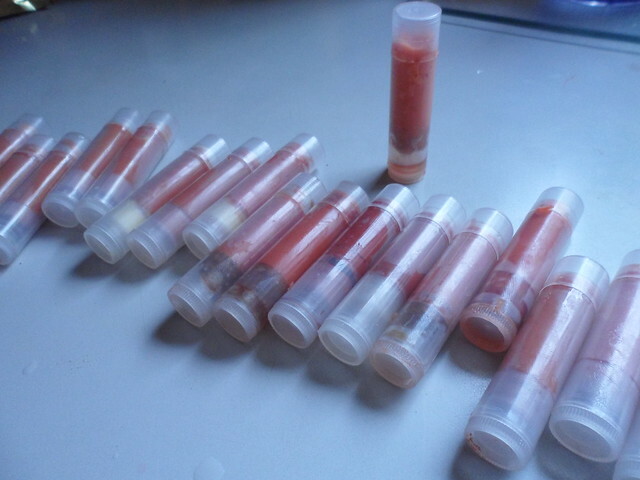 I followed the recipe for my first and second batches of lipbalm (for the second batch I left out the cocoa powder). My third batch, I switched out the almond oil for coconut oil (I like the smell of it better) and added a slice of an old tube of lipstick into the batch. I used about half a tube of lipstick across 25 lip balm tubes, and it created a subtle tint for my lips. Not too noticeable, just adding a tiny bit of color.